Using multiple XJLinks or the 4-port XJQuad, save time by testing a batch of boards simultaneously as a group. Alternatively, run through them independently by continuously unplugging one board that has finished testing and plugging in a new one whilst tests are still running on the other ports. XJRunner also provides statistics on the percentage of boards that have passed/failed as well as Fault Trend Analysis, highlighting tests prone to failure. If any faults are found when running tests, the Layout Viewer and Schematic Viewer* can be used to locate and understand the faults on the board by showing the schematic design and the physical routing of nets, which highlight the potential problem areas. You can also quickly find any component, pin or net in your circuit when trying to pinpoint a fault. In order to use the Layout Viewer you’ll need to use ODB++ when developing the project or the target system. 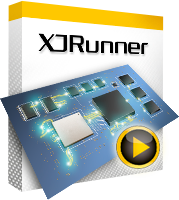 * For manufacturers to use the Layout and Schematic Viewers in XJRunner, you have to explicitly export the relevant information from XJDeveloper. Conversely, if the information needs to be kept confidential, do not export it to XJRunner.